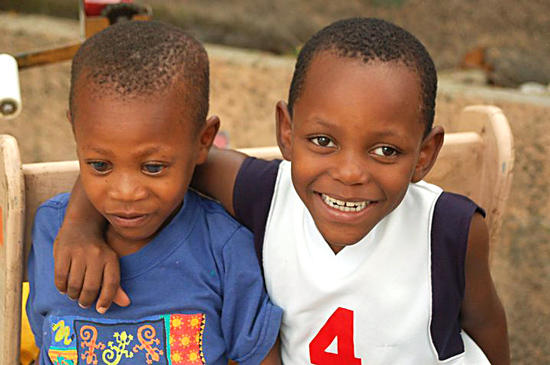 Through every circumstance, God has planned good for Gervens’ story since before the foundation of the world. On February 18, 2017, we watched God finish writing one chapter of that story, redeeming brokenness in a way that only He can. 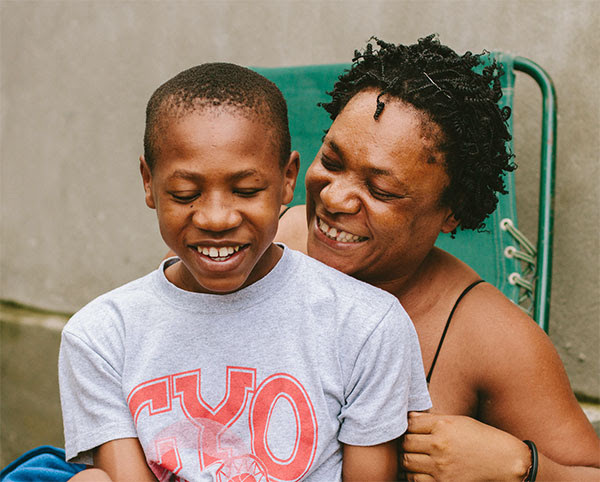 After seven years at the Lighthouse, last month Gervens returned home to his mom and dad. Here’s how this chapter began, and drew to a close. Gervens’ time at the Lighthouse began just before the earthquake in 2010. 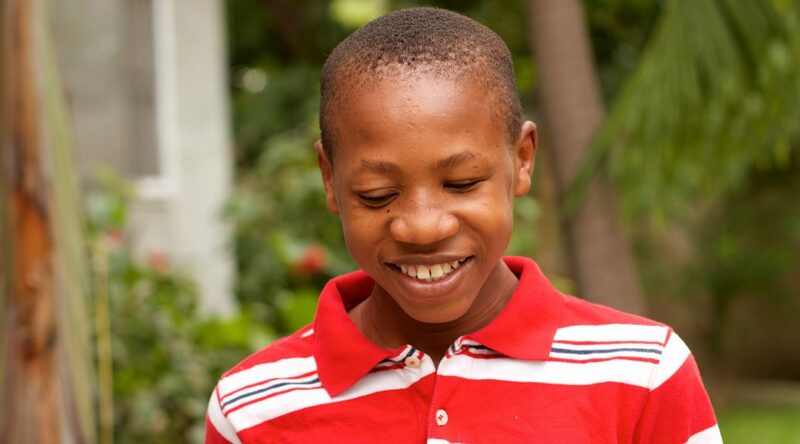 His parents were determined to give their son a chance at life, and when the opportunity arose for Gervens to be further examined by better-equipped doctors and receive better care, they gave him up for a promising future. Not because they didn’t love him, but because they did. For his first few years at the Lighthouse, Gervens’ self-esteem was visibly affected by his disability. His shoulders were often cowered, his face turned toward the ground, his eyes always somewhere between opened and closed. He repeated the same grade over and over because there was no adaptive education for a boy who couldn’t see the chalkboard. 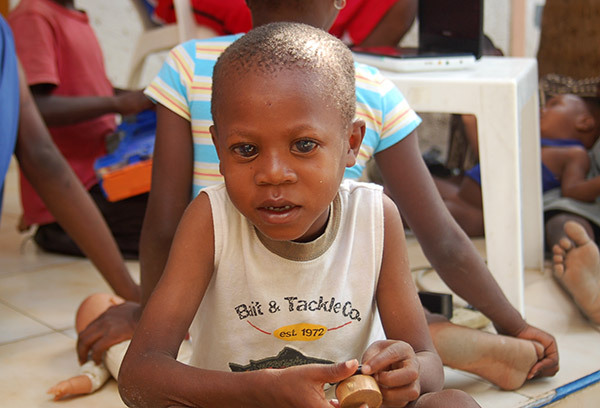 In the fall of 2013, Gervens began attending a special needs school. For the first time in his life, he had an opportunity to learn in his capacity and hear his teachers call him intelligent. 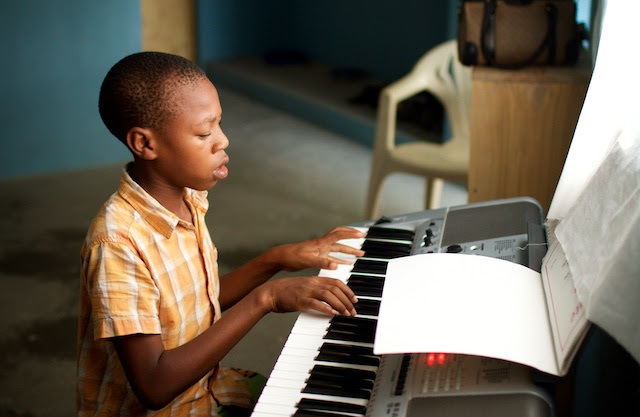 A year later, Gervens began taking lessons—and excelling—on the keyboard. 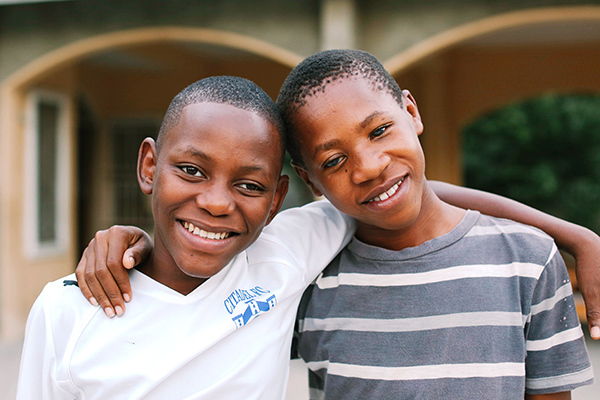 Gervens had begun to thrive at the Lighthouse, but it would be his restored relationship with his parents that would bring true transformation into Gervens’ life. Not long after Gervens began learning piano, his dad came to the Lighthouse with some missing paperwork. A relationship that had been on pause for years began to slowly move forward as Gideon, a music teacher, sat down with his son and heard him play for the first time. As the relationship between Gervens and his parents strengthened over the following months, the spark returned to Gervens’ eyes. His shoulders were now straight, his sweet face now able to be seen, and his eyes were not only opened but bright and wide. He once doubted his value, but now stood confident in who he was, and whose he was. That fall Gervens prayed to dedicate his life to Jesus Christ. Love had taken a hold of his heart. It became obvious last summer that Gervens wanted to be with his parents and his parents wanted to be with Gervens. Full reunification with family had not yet been accomplished with any child at the Lighthouse, but we held great hope for this family. Gideon and Vivian had just one request prior to his move, and that was to provide Gervens a stable and safe home to which he could return. Construction began at the end of November 2016—thanks to many of you who believed in the validity of this dream—and had progressed enough by February to be ready for Gervens to move home. Gervens wanted to spend one last birthday at the Lighthouse, thus choosing Saturday, February 18—four days after his 13th birthday—as his moving day. Following his birthday celebration, Gervens shared with the rest of the kids, who have become his family, why he would be leaving the Lighthouse. There wasn’t a dry eye in the house as each person shared with Gervens what he had meant to them over his past seven years at the Lighthouse. It was evident as moving day drew nearer that Gervens was ready. He was giddy, with that big, sweet grin permanently present on his face. But while Gervens waited with anticipation, a few of the kids, particularly Johnny and Peterson, were grieving the loss of their friend and what this change would mean for them. February 18 finally arrived, and Gervens was beaming. But before we could pack Gervens up and take him home, it was important for the three boys—Gervens, Johnny, and Peterson—to spend the morning together, to provide closure for them, but also to remind them that a friendship this special is worth preserving. 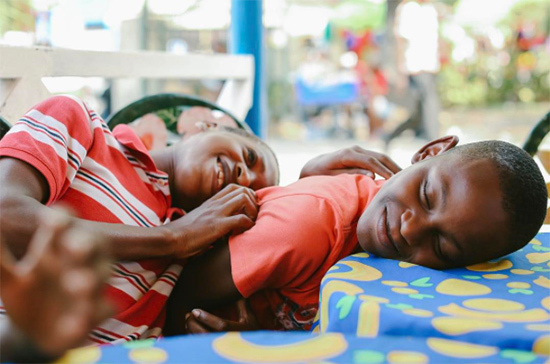 Upon request, we sipped on frappucinos, shopped for some new clothing on the busy streets of Delmas, and concluded our time together with a meal of chicken and rice in downtown Port-au-Prince. The three boys fell asleep on the ride home, as they have done on so many previous car rides. When we arrived at the Lighthouse, Gervens gathered his belongings, and we hopped in the truck. Only Kimberly and Johnny chose to accompany us. The route to Gervens’ house, only a few miles away, felt like a victory. After all of this time, reunification was actually happening. When we pulled up to the house, Vivian, who had been expecting our arrival, greeted us at the door to her yard. She took Gervens’ suitcase from his hand and led us into their new home. Gervens never strayed from her side, sliding his fingers through hers, resting his head on her shoulder, fully realizing this is where he had always belonged. As we walked away from the house toward the truck, Gervens resumed playing the accordion, an instrument his dad had taught him to play last summer. He was not only happy, but his cup overflowed. We will always miss Gervens’ presence in the Lighthouse. I already miss hearing the sound of his keyboard from his room. I miss his gentle spirit and the way he would sprint up the stairs when he got home from school. I miss his jokes and the way he could always make anyone laugh with his wit. We will always miss him, but to know he is exactly where he needs to be, to know that God never forgot Gervens, to know that he feels valued and no longer doubts his worth because he is confident his family loves him—that makes it all worth it. God never forgets His children. He promises to fight for them. He promises He will never abandon those He loves. We praise God for what He has done and will continue to do in Gervens’ life. This victory is all because of Him and all for His glory.